Es-2000N is a electricity automatic control system which uses open type TCP/IP, BACnet/IP, and MODBUS(RS485) communication protocols. Evaluating and analyzing historical measurement/meter reading data of AS system by a system administrator and/or a system designer. 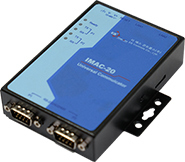 IMAC-20 is a fast industrial network equipment with a compact design and RISC micro processor. It provides reliability and expandability through Linux based TCP/IP and real-time processing function. IDAC-2W is a control device used for HVAC (air conditioning and water heating), BCR's low-noise fan, and other facility equipment. Its LCD display enables a variety of control functions and data communication, and its 23-key number keypad allows easy operation of connected equipment and their settings. Also, 2-WIRE power overlapped (power supply and communication) temperature/humidity sensors and I/O module can easily connect to a network via ports at the bottom. IDM-DO is a digital output device used to operate on-site equipment. It makes up a network via IDAC-2W. It consists of 3 parts: digital output, CPU, and communication. IDM-DI is a digital input device used to monitor the operational status of on-site equipment or to read warning signals. It makes up a network via IDAC-2W. It consists of 3 parts: digital input, CPU, and communication. IDM-AO is an analogue output device used to output the control signal calculated by DDC control program as voltage. It makes up a network via IDAC-2W. IDM-AI is an analogue input device used to receive electric resistance/electric current signal from on-site sensor. It makes up a network via IDAD-W2. It consists of 3 parts: AD/DA converter, CPU, and communication. IDM-DIO is an analogue output device used to output the control signal calculated by DDC control program as voltage. It makes up a network via IDAC-2W. IDM-PI is a pulse counter device. It makes up a network via IDAC-2W. It consists of 3 parts: pulse input, CPU, and communication. DM-RT is a temperature sensor that detects the indoor temperature and is a 2-wire type device that uses a communication system in which communication with the power source (DC24V) is superimposed. IDM-RH is a humidity sensor that detects the humidity of a room. It is a 2-wire type device that uses a communication method in which communications are superimposed on a power source (DC24V). IDM-RTH is a temperature and humidity sensor that detects indoor temperature and humidity. It is a 2-wire type device that uses a communication method in which communication is overlapped with a power supply (DC24V). IDM-OT is a temperature sensor that detects the temperature of the outside air, It is a 2-wire type device that uses a communication method in which communication with power (24 VDC) is superimposed. IDM-OH is a humidity sensor that detects the humidity of the outside air, It is a 2-wire type device that uses a communication method in which communication with power (24 VDC) is superimposed. IDM-OTH is a temperature and humidity sensor that detects the temperature and humidity of the outside air. It is a 2-wire type device that uses a communication method in which communication with power (24 VDC) is superimposed. IDM-DT is a temperature sensor that detects the temperature of the duct It is a 2-wire type device that uses a communication method in which communication with power (24 VDC) is superimposed. IDM-DH is a humidity sensor that simultaneously detects the humidity of a duct. It is a 2-wire type device that uses a communication method that overlaps communication with a power supply (DC24V). IDM-DTH is a two-wire type sensor that detects the temperature and humidity of a duct at the same time and uses a communication method that overlaps communication with the power supply (DC24V). IDM-PT is a temperature sensor that detects the temperature of piping. It is a 2-wire type device that uses a communication method in which communication is overlapped with a power supply (DC24V). The "ERTHO" detector is an indoor temperature and humidity detector designed to detect indoor temperature and humidity. The "EDTHO" detector is a duct temperature and humidity detector designed to detect the temperature and humidity of the duct. The "EPT" temperature detector is a pipe temperature detector designed to detect the water temperature in the piping or tank. The "ERT" temperature detector is an indoor temperature detector designed to detect the room temperature of HVAC or other equipment. The "EOT" temperature detector is an external temperature detector designed to measure the ambient temperature. The "EDHO" detector is a humidity detector for ducts designed to detect the relative humidity in ducts of HVAC or other equipment. The "ERHO" detector is an indoor humidity detector designed to measure indoor humidity of HVAC and other equipment. The ESA (P) Actuator is an excellent Actuator capable of generating various torque and speed by using a suitable reduction gear and power transmission device. It can be applied to Globe Control Valves for Linear Type, Function can display the valve opening to 0-100% by digital, so it can be easily confirmed in the field. It can provide various functions, robust design, high sealing, reliable operation, maintenance And is applicable to heating, air conditioning, and local cooling and heating, and ice storage systems. The EVF21 / 22 valve is a flange-connected cast iron two-way control valve that is widely used in air conditioning equipment, steam, and heating systems. EXF21. The valve is a flange-connected cast iron three-way control valve that is used in combination with the actuator ESA ... Series for control of heating, ventilation, air conditioning equipment, or for a changeover valve. The EXF21 / 22 valve is a flange-connected cast iron three-way control valve that is widely used in air conditioning equipment, steam, and heating systems.